Victoria, known as the “Garden City”, is the capital city of British Columbia, located on the southern tip of Vancouver Island. It is a popular tourism destination ranked in the top twenty of world cities for quality of life. 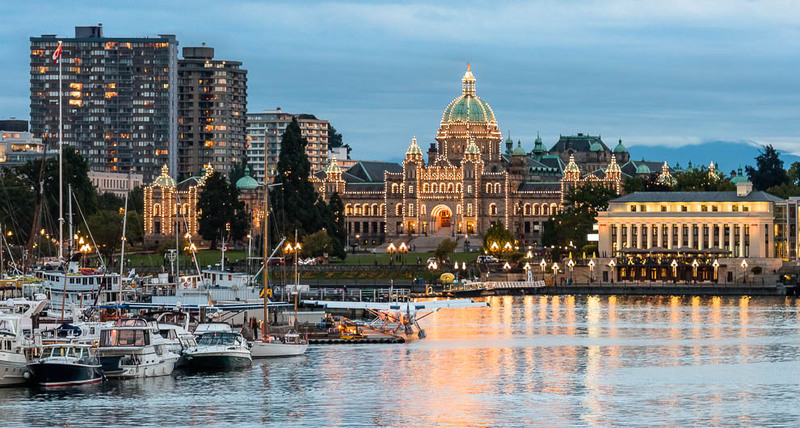 Victoria’s chief industries include tourism, education, technology, food products, and federal and provincial government administration and services. The city has an average of 3.5 million overnight visitors per year, adding more than a billion dollars to the local economy. Downtown Victoria is the central hub for many restaurants, theatres, night clubs, and pubs, and also holds many public regional events. Symphony Splash, Canada Day Fireworks, and other music festivals are among the many events enjoyed by residents and visitors of Victoria. The city also hosted many high-profile events such as the 1994 Commonwealth Games, 2006 Skate Canada, and 2007 FIFA-U-20 World Cup. Victoria experiences the mildest winters in Canada, and the lowest annual rainfall on the province’s west coast, with relatively dry and sunshine-filled summers. This climate allows for many recreational activities including kayaking, golfing, rock climbing, hiking, jogging, and various water sports during spring and summer. The city also has a convenient transportation system run by the Victoria Regional Transit System. The Victoria International Airport provides non-stop flights to and from Toronto, San Francisco, Seattle, and many cities throughout western Canada. Multiple seaplane and helicopter flights are also available daily from Victoria’s Inner Harbour to the Vancouver International Airport, Vancouver Harbour, and Seattle.